All books published in English unless otherwise stated. A short history of the Irish Palatines. Published annually by the IPA to encourage a sense of fellowship, promote dialogue between members, record information and inform of Association developments. The Journal is distributed free to members. Back Issues are available and click here to view a summary of contents of each past Journal. Fr. 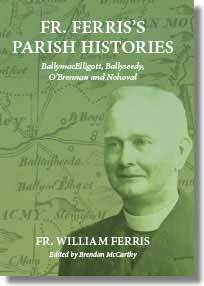 William Ferris spent much of his curacy from 1929 to 1934 in the parish of Ballymacelligott, Co. Kerry, collecting a vast archive of popular history from his parishioners covering the parishes of Ballymacelligott, Ballyseedy and others. The book was banned by the Bishop of Kerry and the manuscript has lain dormant ever since. The book documents not just the history (political, economic and social) of the area and the cultural and topographical landscape, but also comprises a rich genealogical resource including many Irish Palatine family names. Paperback; 6.25 x 9.25; 304 pages; 7 illustrations. Adare: The Augustinian Friary & St. Nicholas Church by Barbara Bingham. Commemorating the 700th anniversary of the Augustinian Friary in Adare, Co. Limerick, this book richly illustrates with photographs and historical detail the friary’s foundation, the monastic life led there and the role it played in the local community. It describes the architecture of the friary buildings, and recounts their more recent history and the renewed sense of purpose they now embody. The Augustinian Friary is one of three medieval religious houses in the town of Adare and is the only one that survives largely unspoilt and unscathed. Many Palatines settled on the Dunraven Estate in Adare, a secondary colony and worshipped in St. Nicholas Church. Their children attended the adjacent school which is housed in the complex. A short history of one of the smaller Christian churches in Ireland from its introduction in the middle of the eighteenth century to the present time. All Worlds Possible - the Domain of the Millers of Coolybrown by Dr. Patrick O'Connor. An entrancing story reaching back to tap the life and times of a Palatine family from west Limerick in 19th century Ireland (1820s to 1960s), embracing the spread of family, friends and relations over far flung corners of the earth including Australia, South Africa and North America. A collection of old traditional Palatine recipes compiled by the people of Assenheim (German ancestral home of the Switzers) to mark the tercentenary of the arrival of the Palatines in Ireland. All Ireland is in and about Rathkeale by Dr. Patrick O'Connor. Exploring Limerick’s Past - by Dr. Patrick O'Connor. An historical geography of urban development in Limerick City and County.